Trying to figure out the difference between 5w20 and 5w30 oil? There are a number of automotive forums that have started rumors about the quality of 5w20 motor oil. Maybe you’ve already discovered these ridiculous threads. I’m guessing that you like to think for yourself and want another opinion. If you’re looking for real information about which oil is best for your car, 5w20 vs 5w30, you are in the right place. In this article we will break down what the numbers on the bottle of oil mean, whether your oil will improve your gas mileage and which one is best for your car. 5w20 vs 5w30: What Do the Numbers Mean? Motor oil is classified by its viscosity. Simply put, viscosity measures the oil’s resistance to flow. Or you could think of viscosity as the thickness of the oil. The higher the number on the bottle the thicker the oil is. For example, molasses has a high viscosity and water has a very low viscosity. When comparing various grades of motor oil, it is helpful to know what each of the numbers on the bottle means. 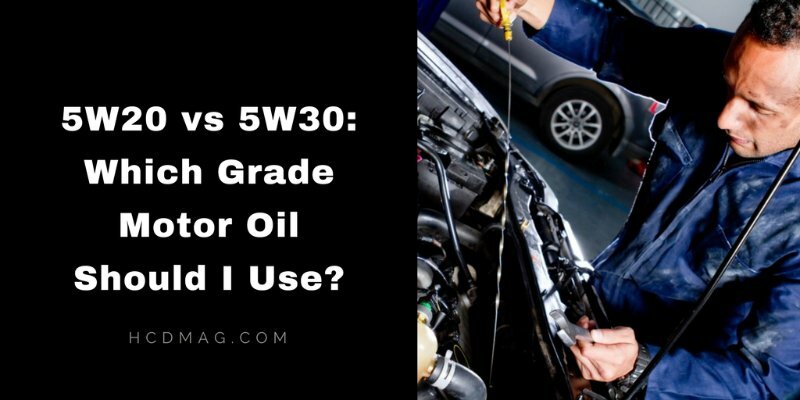 Let’s start with 5w30 as it is the most common grade of oil. Today most oils available at your local auto parts store are multigrade formulas. That means their viscosity is designed to change depending on the temperature. The first number, 5W, represents the cold weather viscosity rating of the oil at 0 degrees Celsius, with “W” standing for winter. When we start our car on a cold winter day, we want the oil to be very thin so it can instantly lubricate the internal parts. However, as we start driving and our engine reaches normal operating temperature, we want the oil to thicken up to better protect our engine. At normal operating temperature, a single grade oil with a viscosity rating of 5 would be too thin to protect our engine. That’s why we use a multigrade oil like 5w30. Based on what I’ve told you about viscosity so far, I bet you can start to guess the difference between 5w20 and 5w30. If you guessed that 5w30 is thicker than 5w20 at normal operating temperature, you’d be right. So why do some vehicle manufacturers recommend an oil with a lower viscosity like 5w20 rather than 5w30? Keep reading to find out below. 5w20 vs 5w30: Which One Provides Better Gas Mileage? A lower viscosity oil like 5w20 will provide a thinner barrier of protection at the normal operating temperature of your engine. Since there is less oil in between the moving parts of the engine, it will provide less friction and therefore better performance. This improved performance caused by using a lower viscosity motor oil usually improves fuel efficiency. You may not notice a huge jump in your MPG, but there will be a slight improvement. Remember, earlier when I said there were ridiculous rumors flying around about 5w20 oil? Well, many automotive forums like to think that the improved fuel efficiency comes at a cost. In fact, many say that using 5w20 instead of 5w30 can cause damage to your engine, resulting in a reduced engine lifespan. Yes, a lower viscosity oil like 5w20 will provide less protection than 5w30 in normal operating conditions. However, a lower viscosity oil is better in areas of the country with lower average temperatures and below freezing conditions. Editor’s Note: You should always use the oil recommended by the vehicle manufacturer. If you are still trying to decide between 5w20 and 5w30 for your vehicle, I recommend that you look in your owner’s manual first. This will help keep your engine running strong for years to come and avoid any costly repairs. As I tried to illustrate in this article, there is only a slight difference between the two viscosities of oil. 5w30 is by far the most common on the market. However, the lower viscosity version, 5w20, is also recommended by many vehicle manufacturers. 5w20 can provide better protection in climates with lower temperatures as the lower viscosity will improve oil movement in freezing conditions.